WASHINGTON, DC--(Marketwired - March 22, 2014) - The Epilepsy Foundation welcomed thousands of individuals and families living with seizures to the eighth annual National Walk for Epilepsy. The event began on the Washington Monument grounds with a welcome from Rick Harrison, lead from the TV series "Pawn Stars," and Coach Jerry Kill of the University of Minnesota Golden Gophers. Both men have been affected by epilepsy. More than two million people in the United States are living with epilepsy and seizures. One in 26 Americans will develop epilepsy during their lifetime. Epilepsy -- a medical condition characterized by recurring seizures -- can affect anyone, of any age, at any time. The number and severity of seizures varies across a wide spectrum. In more than one-third of people living with epilepsy, their seizures resist all forms of treatment and can be extremely severe and debilitating. Since its inception in 2007, the National Walk for Epilepsy has raised almost $8 million to advance access to care, fund research and new therapies, and educate people about seizures and epilepsy. "Living with epilepsy is a daily challenge for individuals and families throughout the country. Many people feel isolated and alone in their quest to find treatments that work," said Philip M. Gattone, president and CEO of the Epilepsy Foundation and the father of a child with epilepsy. "But, for at least one day every year, the epilepsy community comes together to remember we are not alone in our journey. For this one day, epilepsy is not as big a burden. We are very thankful that supporters like Rick Harrison and Jerry Kill are lending their voices to our cause. Together, we can make the kind of difference people with epilepsy deserve." Epilepsy -- a medical condition characterized by recurring seizures -- can affect anyone, of any age, at any time. While it is estimated that one in 26 Americans will develop the seizure condition in their lifetime, current treatments for epilepsy do not work for more than three out of 10 children and adults diagnosed -- leaving many Americans with no or inadequate control over their daily seizures and with the risk of further injury or fatality. The Epilepsy Foundation, a national non-profit with more than 47 affiliated organizations throughout the United States, has led the fight against seizures since 1968. The Foundation is an unwavering ally for individuals and families impacted by epilepsy and seizures. The mission of the Epilepsy Foundation is to stop seizures and sudden unexpected death in epilepsy (SUDEP), find a cure and overcome the challenges created by epilepsy through efforts including education, advocacy and research to accelerate ideas into therapies. The Foundation works to ensure that people with seizures have the opportunity to live their lives to their fullest potential. For additional information, please visit www.epilepsy.com. "Like" the Epilepsy Foundation on Facebook at www.facebook.com/epilepsyfoundationofamerica and follow us on Twitter at www.twitter.com/epilepsyfdn. 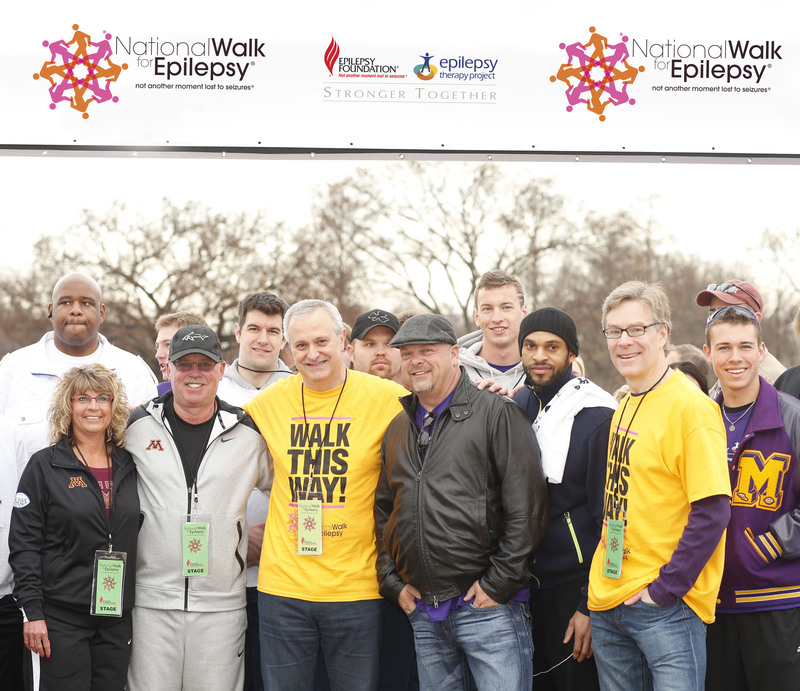 Front row pictured (l to r): Rebecca Kill, University of Minnesota Coach Jerry Kill, Epilepsy Foundation President & CEO Phil Gattone, "Pawn Stars" lead Rick Harrison, Athletes vs. Epilepsy Initiative Co-Chair Geoff Pope, Epilepsy Foundation Chair Warren Lammert, and Athletes vs. Epilepsy Initiative Spokesperson Dalton Richey.